A couple of weeks ago, my map of “The Corporate States of America” went viral. My email started blowing up, and the number of visitors to my blog soared exponentially. I was pleased as punch to see my Corporate States map featured on BuzzFeed, Gizmodo and the Huffington Post. It was also nice to hear from all my readers. I read all of your comments, and learned some interesting things. There was quite a lively debate in the comment section about what brands should represent each state. As I mentioned in my original blog post, my choices were somewhat subjective, and there were alternative suggested for just about every state. That said, some of my choices were more controversial than others. 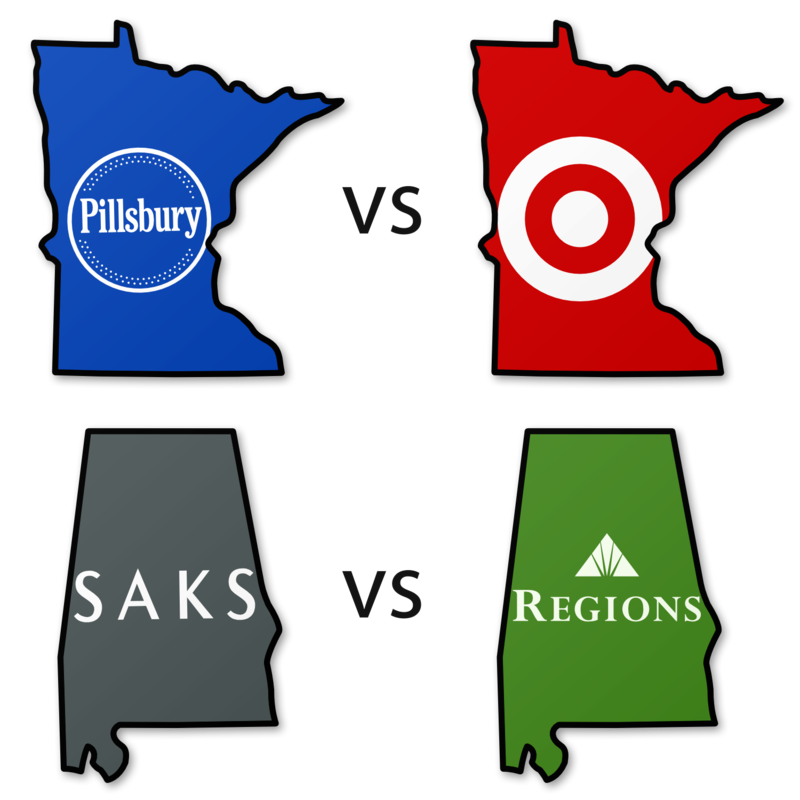 For example, I chose Pillsbury for Minnesota, to represent the state’s great flour mill heritage. Many readers suggested Target or 3M instead. For my next map, I will use one of these two, though I’m leaning toward Target, since it’s probably a little more well-known. Again, this is where that subjective methodology comes into play. Of all the brands I chose for the Corporate States map, Alabama was the most controversial. I put Saks, the parent company of Saks Fifth Avenue, which was originally incorporated in Birmingham. While this was technically true, many of you thought that I should choose a brand that better represents Alabama. Unfortunately, there were few suggestions about what to include instead. For my next map, I’ll probably go with Regions Bank, though I’ve also thought about Books-A-Million, which has been the second-largest bookstore in America since the fall of Borders. Which one do you think I should choose? I spent a long time researching the original Corporate States map, but research is no substitute for first-hand experience. For example, I’ve never been to West Virginia. After much research, I chose Gino’s Pizza and Spaghetti to represent the state. However, several of my readers have told me about another restaurant chain called Tudor’s Biscuit World. I had never heard of Tudor’s, but after looking at their menu, it’s definitely somewhere I’d love to check out if and when I visit the Mountain State. West Virginia was a tough call, but one of the hardest decisions I had to make was New Mexico. I chose Allsup’s, a convenience store chain with locations across the Southwest. While many New Mexico residents liked this choice, others begged to differ. In fact, KOB 4, an NBC affiliate out of Albuquerque, interviewed several locals about my choice. From that segment, I learned about Blake’s Lotaburger, another restaurant I’ll have to check out next time I’m in New Mexico. They say that imitation is the sincerest form of flattery. In that case, I have been quite flattered to see “The Corporate States of America” inspire other graphic designers. First there was blogger Bohemian Style, who made a similar map called the “Corporate Prefectures of Japan”. Then there’s Chad Huber, made his own Corporate States map based on my design. I’m quite font of Huber’s map, which has a flat, tiled look reminiscent of Windows 8 or iOS 7. My favorite Corporate States map comes from the website Thrillist. Their map, called “Red, White and Hooch”, shows a famous beer or liquor for each state. As a fan of the Craft Beer revolution, this is definitely a map that I can raise a drink to. Once again, I’d like to thank everyone who commented on “The Corporate States of America”. I am working on some new designs, and I can’t wait for you all to see. Thanks again for your moral and financial support! Thanks for picking Great Harvest to represent Montana! We are so proud to be representing this great state and it’s been fun to watch your map take off across the web. I would have chosen John Deere to represent Iowa. They are headquartered and manufactured in Waterloo. But John Deer is headquartered in IL . We know who we’d love to see representing Alabama. Awesome project! Looking forward to the next iteration. The Chad Huber link is now a dead link. Thank you for catching that, Jack. I have removed the dead link.